Inlaid work or intarsia quilts. 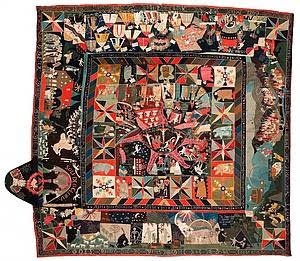 The earliest patchwork quilts seem to be done in a technique that is neither piecing nor applique, but a kind of inlaid work called intarsia. 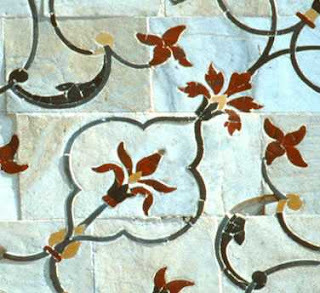 Intarsia was more commonly done in woodwork and stone work, for example this marble intarsia from the Taj Mahal. 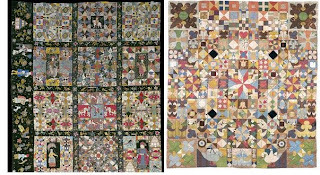 Craftsmen in several European cultures created intarsia patchwork hangings, as in the four pictured below, which are featured in a current exhibit in Vienna. Inlaid-Patchwork in Europe from 1500 to the Present will be up until March 14th at the Austrian Folk Art Museum. Christianity is a common theme, but notice the geometric blocks that resemble piecework in the one above and those below. Many of these are probably pieced over paper. The Masonic symbol of the all-seeing eye is in the center of this one. 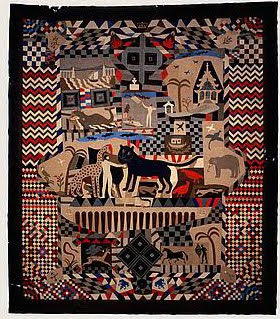 When Nancy Hornback and I went to Germany a few years ago looking for sources of applique design we saw several of these, called tailor's quilts, very complex patchwork of wool made by tailor's apprentices as a rite of passage or a project to develop sewing skills (or patience). 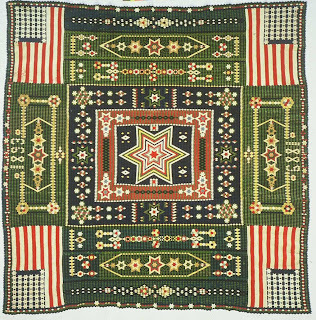 A related style: uniform quilts, military quilts or soldier's quilts. The wools in these tend to be very tightly woven fabric known as serge or baize that has the bright color and the texture of felted wool. (Baize is the wool that covers pool tables today.) Uniforms were made of this dense fabric and soldiers in hospitals and on dull duty occasionally passed the time by making complex quilts of uniform pieces. Soldier's Bed Cover, made by Jewett W. Curtis (1847-1927), Alaska, dated 1889-1893. 99" square. Collection of the Smithsonian Institution. Pam Holland's written a book with patterns for a Prussian quilt dated 1776. See more about it on her blog. And see more photos of some amazing quilts in Inlaid-Patchwork in Europe from 1500 to the Present by clicking here to see an online exhibit in their press release. These are such unbelievably complex, astounding quilts. Thanks for showing them to us, and the links to more information are always appreciated. The tailor's quilt sounds kind of like the equivalent of the samplers that young girls stitched, showing their proficiency with needle and thread. 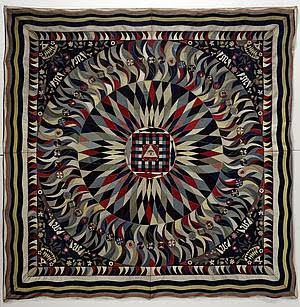 These intarsia quilts are simply fascinating. Wonderful quilts, love the welsh tailor's quilt. Late tonight, so will have to come back tomorrow to check out the links. Very lovely quilts, but I still don't really understand what this technique is. Is it pieces laid side by side with edges turned under, but not paper, and sewn together on the right side? How does it differ from applique or from English paper piecing? I feel very stupid! 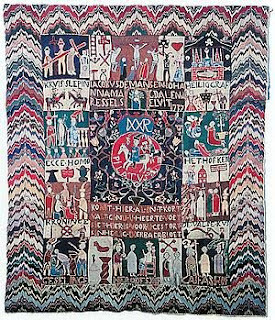 I clicked on the volkskundemuseum and was amazed by the display technique as well as the quilts. Wouldn't it be great to have the room to frame an antique quilt like they did? It was all so sturdyand catapult-like. Thanks for sharing.